Work Ready Communities help you match employees to jobs based on verified skill levels. 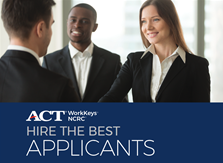 An ACT Work Ready Community is one where the supply of ACT WorkKeys National Career Readiness Certificates earned by individuals is matched with a demand for ACT WorkKeys NCRC from employers who either recognize or recommend the credential. ACT has developed a methodology for establishing county goals proportionate to a community's size. Once 'certified', the county can continue to maintain their status keeping the flow of supply and demand in sync. Employers can help their communities build a stronger workforce with the right foundational skill set by supporting their states and counties by learning how the ACT WorkKeys NCRC can help them find the right employee with the right skill set. ACT WRC participating states, regions and counties offer a suite of ACT Work Keys assessments and the ACT WorkKeys NCRC that measure an individual's foundational workplace skills such as math, reading, information and locating skills required for a majority of today's jobs. The ACT WorkKeys NCRC complements such traditional credentials as high school diplomas, community college degrees, and certificates of technical proficiency. Academic credentials mark the fulfillment of an individual’s classroom learning experiences. The ACT WorkKeys NCRC relies on standardized assessments and confirms an individual’s competence in a specific set of workplace skills. Your participation in ACT Work Ready Communities [ACT WRC] benefits not just your company, but your entire community. ACT WRC is helping job seekers in your area understand what skills employers like you are looking for, and it helps local educators prepare students for success. And — they need you as an employer to value their earning an ACT WorkKeys NCRC! Read the Summary of ACT WorkKeys Validation Research.